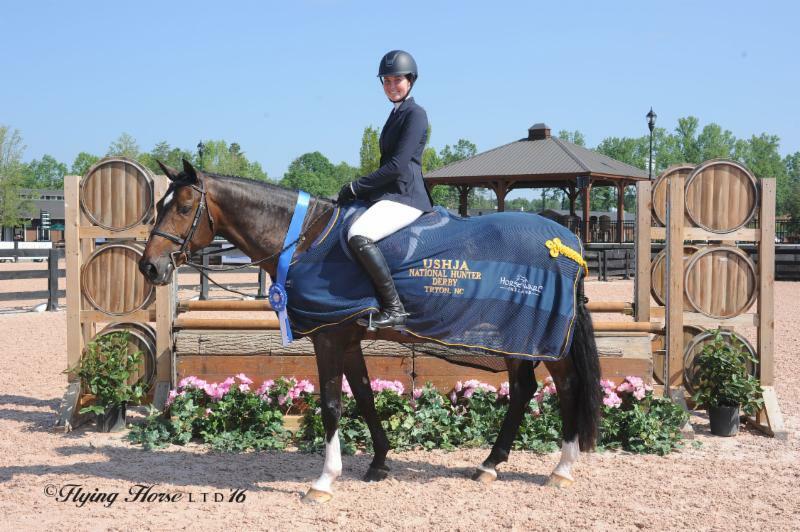 Hunter Holloway of Topeka, KS, continued her momentum from Tryon Spring 6 into this week's competition, capturing top honors in the $10,000 USHJA National Hunter Derby hosted at TIEC aboard Entourage, owned by Hays Investment Corp. with a total score of 173. Blythe Marano of Franklin, TN, and Fondant, owned by Virginia Ingram, finished in second with a total score of 172.5, while Daniel Bedoya of Magnolia, TX, and Playbook, owned by Monica Hanks, collected third place, receiving a 170.5. "He's seven and we got him a year ago. 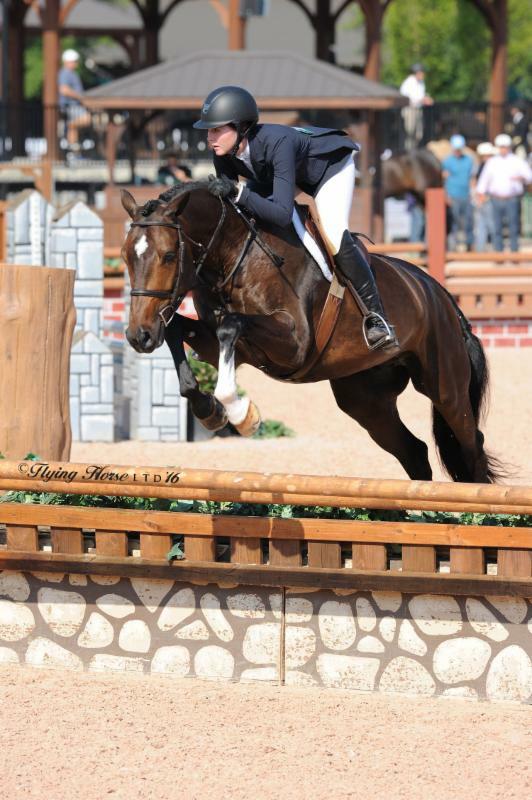 He moved up to the Junior Hunters towards the end of the season in Ocala and has been really awesome ever since. He just keeps stepping up," commented Holloway. "He scored a 90 last week and a 91 today so I'm feeling pretty good about how he's going right now." "There were a lot of inside turns that were options and I felt like I had ground to make up from the first round so I decided to go for them," she said. "I wanted to take the chance and really go for it. He handled it very well. He was up for the task all the way around and I was really impressed." Hunter Holloway and Entourage in their presentation ceremony. Entourage began his derby career this past spring with Holloway guiding from the irons and he's displayed a sense of consistency and bravery that has impressed everyone at Equi-Venture Farm. "He's very easy and is a really straight forward horse. We're hoping for a good summer season and success at indoors in the fall," she smiled. Competition at TIEC continues tomorrow with the $130,000 Ariat® Grand Prix CSI 3*. Gates open to the public at 6:00 p.m. and competition begins at 8:00 p.m. Parking and general admission are free! For more information on TIEC and to see a full list of weekly results please visit www.tryon.com. Photo Credit ©FlyingHorsePhotography. These photos may only be used once in relation to this press release.